A cheating husband. His wronged wife. A whole lot of money. And murder. When Gina Beaufort Kelly’s husband leaves her for a woman young enough to be his daughter, Gina is disgusted, and determined to get what she deserves. After 18 years of marriage, in sickness, health, and so on, the least David can do is compensate her fairly when he dumps her. But David feels differently. He has a hot new mistress to spend his money on, and an image as a stud to uphold. And when he ends up dead the evening before the divorce is final, in his brand new, fire engine red Porsche, suspicion falls squarely on Gina. 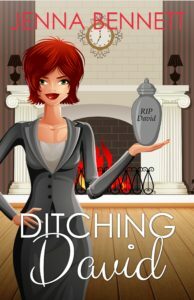 Now the jilted trophy wife must figure out who (else) had a reason to want her soon-to-be-ex-husband dead – and why – before the delicious Detective Mendoza can slam the cell door behind her and throw away the key. 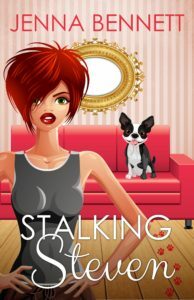 Fresh from solving her late husband’s murder, Gina Beaufort Kelly is dealing with her first case as a licensed PI: stalking Steven Morton, the husband of Gina’s divorce attorney, Diana Morton. University professor Steven is spending significant time with a beautiful, blond Russian young enough to be a student, which sets all of Gina’s antennae quivering. But what’s supposed to be a simple case of philandering soon turns sinister when the nosy neighbor of the young Russian girl is murdered, and Steven and the young woman are nowhere to be found. Add in a ransom note for Steven’s return, a bloody attack on Gina’s associate Zachary when he asks questions about the Russian girl, and the Boston Terrier that used to belong to the murder victim, but that has now attached itself to Gina, and the newly licensed PI has her hands full. Can Gina find Steven, avenge Zachary, and discover a killer before it’s case closed… for good?